1. Synthetic clothing made from combustible, melting fabric should be removed as soon as possible. In such situations it is best to wear clothes made from such natural materials as leather or wool. They are not subject to such rapid ignition in comparison with clothes made of synthetic fabric. Natural clothes provide a greater degree of protection in case of fire. 2. Always wear shoes. This will protect your feet from possible debris. Women, so as not to pierce the inflatable emergency ladder, it is better not to wear shoes with a thin heel. 3. If there is an increased risk of emergency landing, all heavy and hard things should be removed from the upper shelves. Place your luggage under the chair. 4. In a situation where emergency landing can not be avoided, it is necessary to put on a cap of a hard-to-ignitable material or to wrap the head with a suitable piece of clothing. These simple actions will help protect the head from debris. Then take a pose that will reduce the risk of some injuries: you should sit deep in a chair and rest your hands in the front seat, cover your face, put your head in your hands and bend to your knees as much as possible. 5. 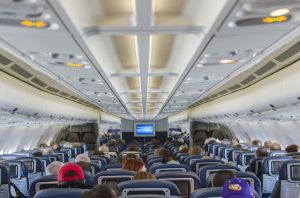 Do not unfasten your seat belts and do not leave the seat until the aircraft stops completely, because after the first blow or shock, the next stronger blows may follow. 6. In case of an emergency landing, leave the aircraft as soon as possible. This will increase the chances of rescue before possible ignition and explosion of fuel. 7. You can leave the plane through the main and emergency hatches, which are available in each cabin. Emergency statistics show that passengers, as a rule, try to leave the plane through the entrance from which they entered, which leads to the formation of traffic jams at the entrance and death of passengers.